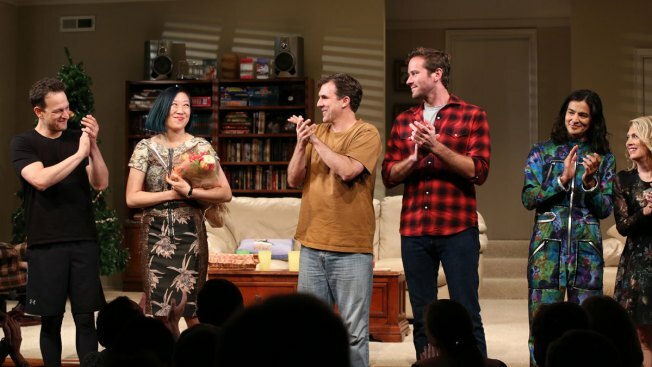 Young Jean Lee became the first Asian-American woman playwright to have a play open on Broadway when "Straight White Men" made its official debut Monday. Breaking the glass ceiling for Asian-American woman playwrights was a special honor for Lee. But that distinction comes with some pressure. "It makes me really hope that this show does well because it puts a little additional pressure on you because you want that door to stay open," Lee said. The playwright is thankful for shows like "Hamilton" for helping pave the way, by proving "shows by people of color, featuring people of color... could fill houses." Her father-son drama stars Armie Hammer, Josh Charles and Paul Schneider playing brothers. Stephen Payne plays their dad. The story takes place on Christmas Eve as the family gathers for the holiday, eating Chinese takeout in their plaid pajamas and trash-talking one another. But when a question is raised that they can't answer, they are forced to confront their own identities. Lee said she was inspired by the idea of white men feeling marginalized because they were now being labeled. But she wanted to show both sides of issue, and let the audience draw its own conclusions. "I just noticed that you know there was this sort of historical shift happening in my lifetime where all of a sudden, straight white men were suddenly experiencing what it's like to get labeled," she said. "So, I just got really interested in exploring that." Hammer, whose film roles include "Call Me by Your Name" and "The Social Network," is making his Broadway debut in the play. "This was an amazing chance to really look at the concept of white privilege and what it means, and how people in this situation communicate with each other and understand each other," Hammer said.